I switched a little bit things (what a surprise...) : two tags instead of one ; no pocket but I kept the circle pattern and made a rosette out of it ; I kept the twine but not the banners. 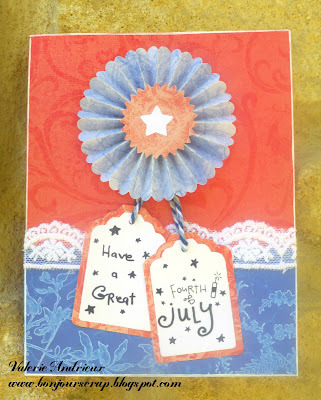 Of course I used DCWV papers (Old world stack), the Sizzix/ Tim Holtz rosette die, blue twine (Maya Road) and some white lace found at Hobby Lobby. Give this challenge a try, youll have until the end of July to send your project.